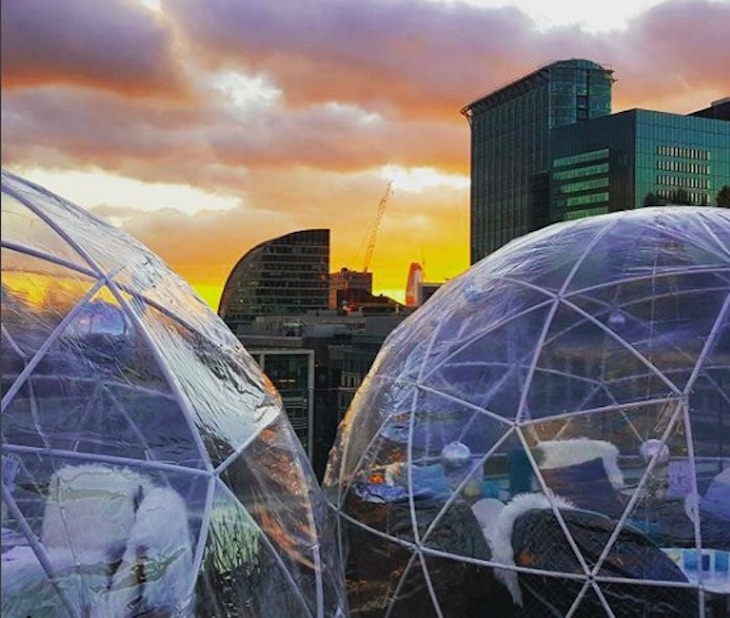 Where to eat, drink and be merry in igloos, globes, domes and other such transparent structures in London this winter — ideal for Christmas parties, meeting friends, and date nights. We hold Coppa Club entirely responsible for starting this igloo trend. 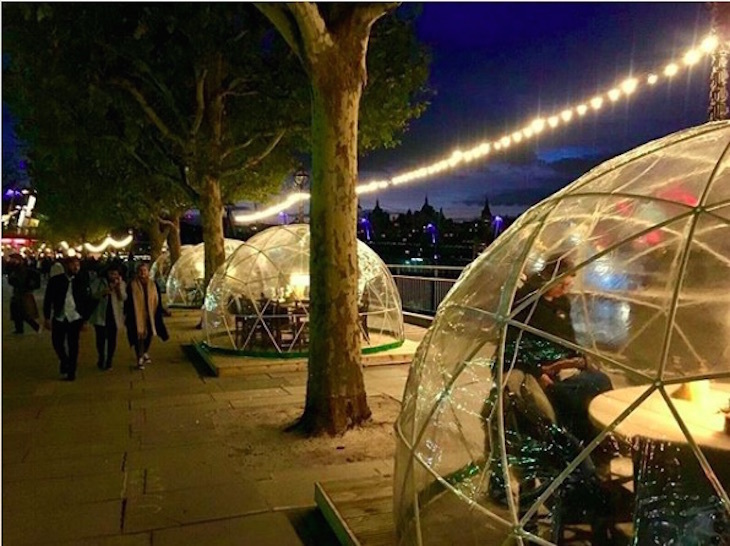 The winter igloos have popped up alongside the Thames for the last few winters, and they even had a Mexican makeover for summer 2018. 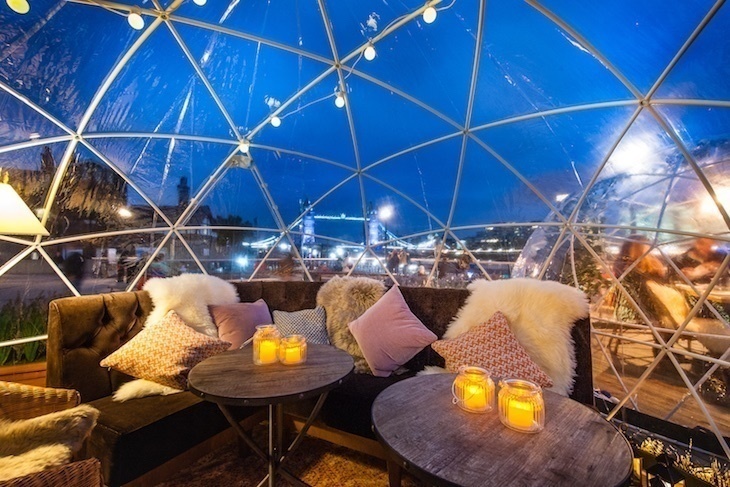 They're back for winter 2018 with soft sofas and sheepskin blankets for cosying up with a cocktail or two — or book yourself a dining igloo and make a meal of it. Coppa Club Tower Bridge. Booking from 9 October 2018. 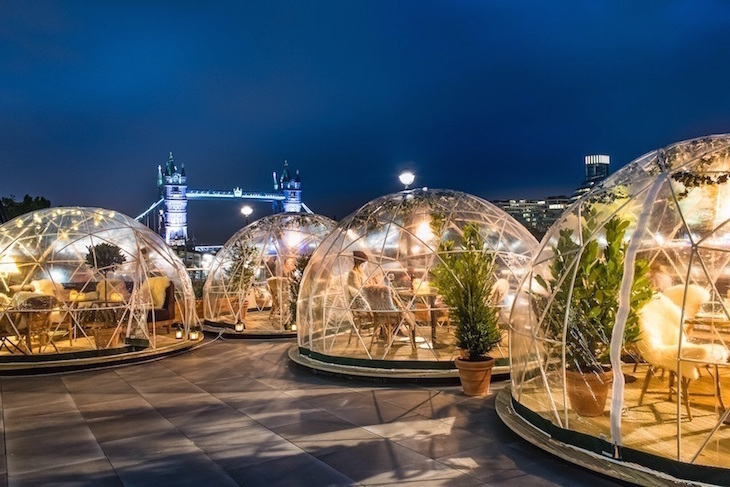 They've already put an ice rink, bars, restaurants, croquet and pentanque on the roof of Tobacco Dock, so why not heave a gaggle of igloos up there too? They're opening for the first time this year, along with mountain huts, and winter food including mulled wine and roasted chestnuts... oh, and raclette courtesy of Raclette Brothers. Skylight at Tobacco Dock winter season, 1 November 2018-27 January 2019. Bookings are open now — entry to Skylight is free, and igloo hire starts from £60. This fancy rooftop bar restaurant sits atop the Montcalm Royal London Hotel, so you get City skyline views from the 9th floor thrown in. It opened in winter 2016, and the igloos made their first appearance last year. You'll have to book a whole igloo if you want in on the fun. They're designed for 10 people, and food and drink packages start from £200. Aviary, 22-25 Finsbury Square, EC2A 1DX. Igloos open November-March, bookings open now. After a successful winter 2017 run, Jimmy's Lodge is back on South Bank for 2018, hosted by chef Jimmy Garcia. 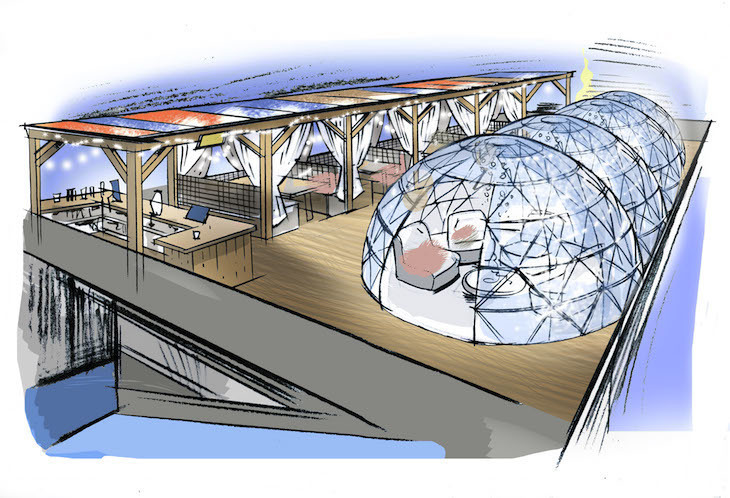 The wooden ski chalet style restaurant returns, along with those igloos. They're private (for 6-10 people), they're heated... and they're not cheap. Hire of an igloo requires a minimum spend of £600, but the menu looks set to include such luxuries as venison tartare and alpine fondue. Perhaps see if the boss'll pick up the tab for your work Christmas party. Jimmy's Lodge, Queen's Walk, South Bank. November-December 2018 — join the mailing list to find out when booking opens.